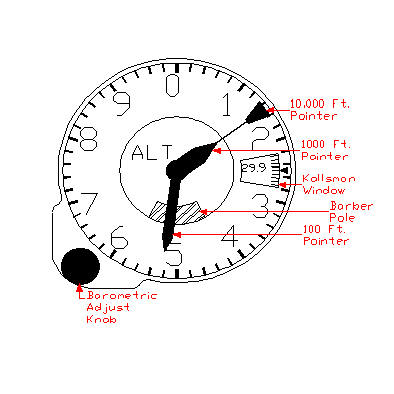 The Kollsman window is located at the 3 o’clock position on the altimeter dial. This window allows access to read a sub-dial, which contains the barometric readings. The arrowhead indice located precisely at the 3 o’clock position on the altimeter’s main dial is used as the reference point for reading the barometric sub-dial. Most altimeters will have a sub-dial, which covers the readings from 28.1 InHg (inches of mercury) to 31.0 InHg. On the sub-dial each major indice is read as 0.1 InHg, each minor indice is read as 0.02 InHg. As previously, stated, weather conditions will greatly affect the pressure of the atmosphere (the barometric reading). Altimeters report altitude as a function of atmospheric pressure. Typically pilots will obtain a local barometric reading from the nearest airport. They will then set the Kollsman window to the setting that they received. This action will adjust the altimeter reading, eliminating error due to local weather conditions. Some altimeters will have a Kollsman Window, which reads out in milli-bars in lieu of InHg. These are usually altimeters designated for use in Europe. However use of milli-bars has become more common in the U.S. during the last few years. Milli-Bars is just another unit of measurement, 1013.2 milli-bars = 29.92 InHg. The “Barber Pole” on the face of the altimeter is visible only when the altitude is above sea level. When the altitude is below sea level the barber pole is no longer visible. This is provided to avoid the error of reading –1,000 Ft. as being +10,000 Ft.
A standard altimeter for general aviation comes in a 31/8” diameter case. This is a standard size case for most general aviation indicators. It is important that the altimeter case be airtight as the case contains the static pressure input. A leaky case will cause the indicator to give erroneous readings. There is one pressure input on the back of the case. This input is the “STATIC PRESSURE” input and is connected directly to the static port on the aircraft, which is exposed to the outside atmosphere. An aneroid is essentially a balloon made of very thin metal. Typical metals used for this purpose are copper or brass. The aneroid, when first manufactured is sealed at precisely 29.92 InHg that is the standard atmospheric pressure for a standard day at sea level. Because the aneroid is sealed at this specific pressure, any change in the pressure surrounding it will cause it to either expand or contract in a manner which is directly proportional to the change in the surrounding pressure. This expansion and contraction are relayed to the pointer via the mechanical linkage assembly. It is important to note that the aneroid is extremely delicate. Very fast changes in altitude can and will damage the aneroid. The Mechanical Linkage Assembly is comprised of a link, several types of gears, glass jewels, pivots, a hairspring and a bimetal assembly. The link directly connects the aneroid to the gears. The gears transfer the aneroid movement to the pointer. The glass jewels are bushings for the gear pivots to ride in. Pivots are the axles for the gears. The hairspring assembly provides an anti backlash function for the gears helping to eliminate hysteresis errors. The bimetal assembly provides the function of correcting for temperature changes. The dial and pointer assembly contains the read out information for the pilot. A typical three-pointer altimeter has, as the name would imply, three pointers. These are connected to the aneroid via the gears. There is also a main dial with major indices numbered 0 thru 9. The 0 indice is located at the 12 o’clock position on the dial. The numbers 1 thru 9 are then linearly distributed around the dial face. Each main indice is subdivided by 4 minor indices, which are equally spaced. Behind the main dial is a sub-dial. The sub-dial is viewable at the 3 o’clock position on the main dial. This opening is called the “Kollsman Window”. The reading in the Kollsman Window is settable via the barometric adjust knob which is located, on modern altimeters, in the 7 o’clock position of the instrument face. Older altimeters will have the barometric adjust knob located at the 6 o’clock position.